These 15 companies sat out the huge market rally -- and a few were on the losers list last year. 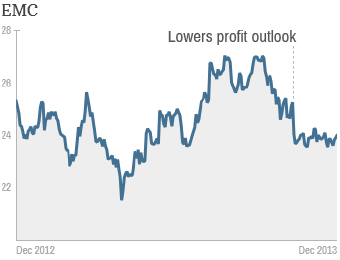 From repeats like J.C. Penney to tech giant IBM, here are 2013's worst-performing stocks. EMC managed to maintain solid growth in 2013 despite a tough environment for the data storage and IT services market. The company is expected to report full-year 2013 earnings of $1.80 per share, up about 6% versus last year. Sales are expected to rise 9% for the year. But that's not good enough for investors who have grown accustomed to higher levels of growth. EMC's third-quarter results in October failed to impress Wall Street. Analysts say data storage technology is rapidly evolving and EMC (EMC) is facing fierce competition from larger rivals such as IBM and HP (HPQ).